School Psychology Awareness Week 2018 - Unlock Potential. Find Your Password. ​School Psychology Awareness Week is an initiative of the National Association of School Psychologists. During the week of November 12-16, 2018, schools throughout the country will celebrate National School Psychology Awareness Week to highlight the important work school psychologists and other educators do to help all students thrive. ﻿The theme for School Psychology Awareness Week 2018 is Unlock Potential. Find Your Password! A password is a personal key for unlocking any number of areas of potential in our lives. 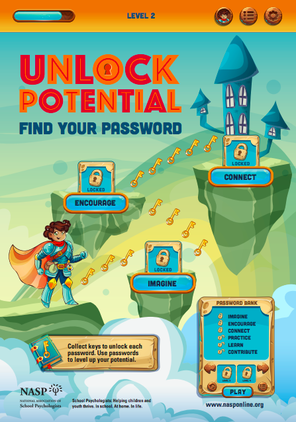 The goal is to connect with how modern youth and adults unlock things (e.g., gaming levels, phones, devices, codes) and to highlight how thinking about specific skills, assets, or characteristics as "passwords" can lead to positive growth. Licensed Specialists in School Psychology are particularly skilled at assisting students and staff in unlocking the resources, proactive and preventive skills, and positive connections necessary to unlock one's full potential to thrive in school and life. A password can help us set goals, identify action steps, communicate need, and engage in discussions to help create the connections necessary for students to develop critical academic and social emotional skills. Unlocking potential can take many forms. It can mean taking action to speak up when bullying occurs, engaging in learning, trying a new activity or skill, cleaning up trash on the playground, doing something kind for a classmate or neighbor, or making new friends. These actions empower children, create compassion, strengthen connections, and build resiliency—all traits that are critical for academic and social–emotional success. Unlocking potential to grow as an individual and to make the world even a little bit better can have a long lasting impact. Talk to your kids passwords to help them unlock potential—key words or phrases to help them take steps toward positive change. Password ideas include: dream, laugh, connect, imagine, create, encourage, share, listen, help, explore, try, speak up. Help your children develop positive relationships with peers and adults, and model respectful, caring behaviors with others. Help your children identify their strengths and interests, learn new skills. Emphasize that learning and growing require trying new things and that success comes from small steps to a long-term goal. Encourage goal setting and mapping out a plan for achieving the goals. Talk with your children about steps they have taken, what worked and what didn’t, and what they might do next. Praise attempts, as well as success, and make sure that you focus on the effort or hard work put into the success. Emphasize the importance of deliberate practice that talent is developed over time through skillful practice. Create an environment at home that allows your children to explore building (playing with blocks, helping with projects, and more), drawing (crayons, finger paints, paper), and music (on the radio, with children’s instruments, or through formal training through school or community resources). This may help to identify special interests. Help your child work through setbacks, or lack of self-confidence, by helping to identify negative thoughts that may suggest concerns about his or her ability to be successful. As a parent, you can help children see what the small steps are and how persisting and overcoming obstacles is a part of succeeding. Help your child realize that setbacks are not permanent or all-encompassing. Seek out support systems available in the community to help your children learn new skills and thrive, such as tutoring or mentoring programs. Encourage your children to participate in community activities that may help them to develop positive behaviors, such as being grateful. In particular, volunteer activities may encourage the development of positive behaviors. Consider participating in community events yourself as a role model. Encourage your children to participate in school and community activities that may help them to develop positive behaviors, such as being grateful. In particular, volunteer activities may encourage the development of positive behaviors. Consider participating in community and school events yourself as role a model.